This time I went to see the temple illumination event of Hosen-in in Ohara in northern Kyoto! This event is only held in autumn, but as it is a bit far from central Kyoto, there are not many people, and it feels very relaxing. Ohara is a bit far from central Kyoto, but if you can stand an hour’s bus ride, it’s an area definitely worth a visit. Normally Ohara is not very busy, but in autumn it turns into one of the busiest remote areas of Kyoto. 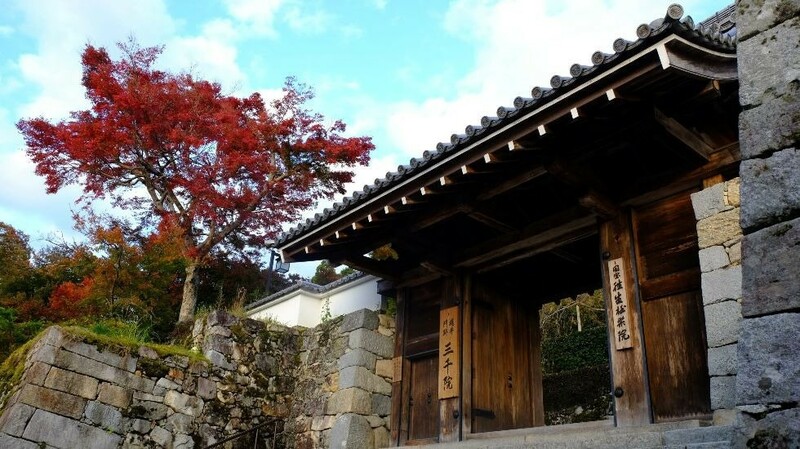 You can find such famous temples as Sanzen-in and Hosen-in in Ohara, both of which are must-visits in Kyoto. 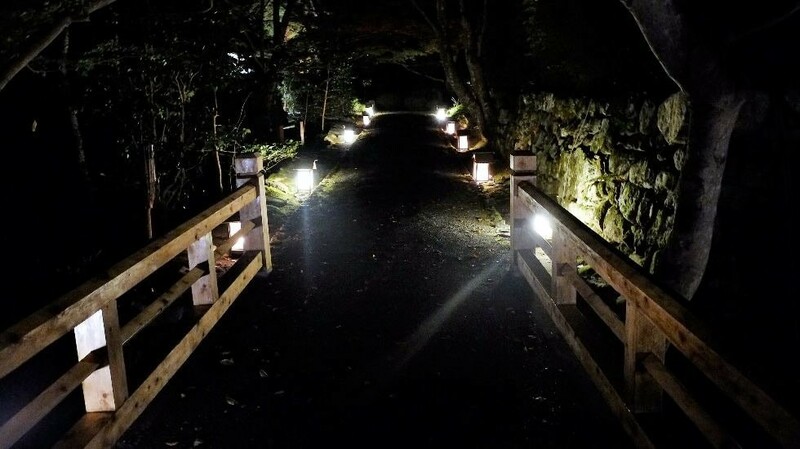 But this time we had a mission in Ohara: we were going to see the special night entrance of Hosen-in Temple. 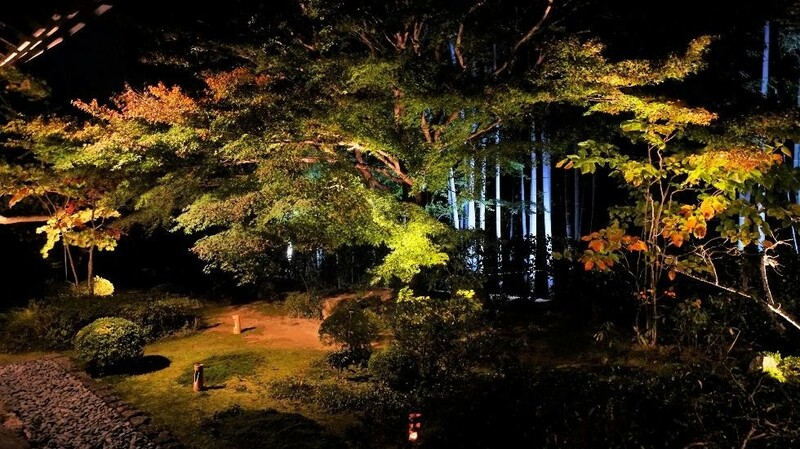 This event takes place every year when the autumn leaves are at their best, and you get to enjoy the mystical temple atmosphere at night (the illumination event is held until December 2 in 2018). There is something special about autumn in Kyoto, as the green maple leaves gradually turn into beautiful shades of red and yellow. But can you imagine all this at night, when the dusk turns to night and the temple lights are lit, and when you walk the ancient walkways of the temple and gaze at the fantastical play of nature in the garden. So, we headed to Ohara at around 3 pm, because this way we could see Sanzen-in Temple before going to the night illumination event at Hosen-in. Sanzen-in Temple was really pretty, but unfortunately, the autumnal typhoons had hit the trees pretty badly, so the leaves were not as pretty as usual. 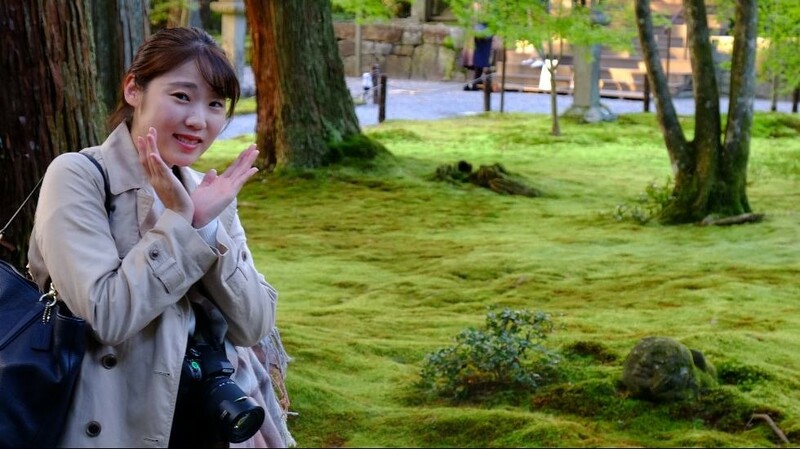 The funny rakan statues are a must see at Sanzen-in Temple, and there is a great spot where you can have your photo taken with them just like Yumemi in the photo above. Then as we had some time to kill before we could enter Hosen-in (the night illumination starts at 5:45 pm), so we looked for some cafes in the area. But unfortunately, it seems like everything closes very early in Ohara, so the best we could find was a can of Coca-Cola Zero. So, after waiting for a bit over an hour, we headed to the temple, and then waited a bit more in front of it. Then, at last, it was time to head in: to see the beautiful temple garden at night (entrance is 800 yen per person). The yellow leaves of the maple trees were also really beautiful. 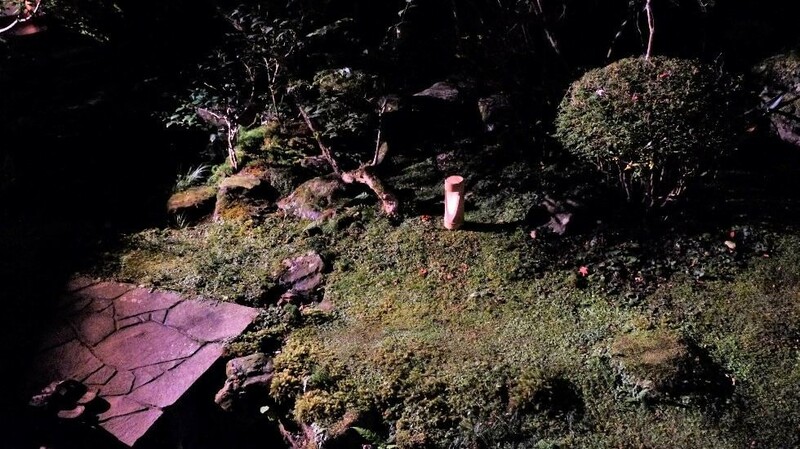 The moss of the garden looks a bit different at night – there is something about it that feels alive, just like there was something hiding behind each bush and tree. 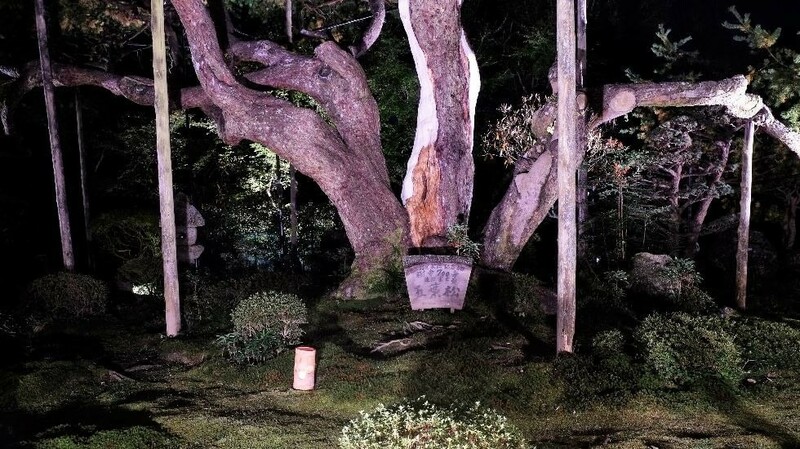 But the main attraction of the temple is this huge pine tree in the middle of the garden that is said to resemble Mt. Fuji. At night it looks almost like a heart tree, although without the face carved in it. 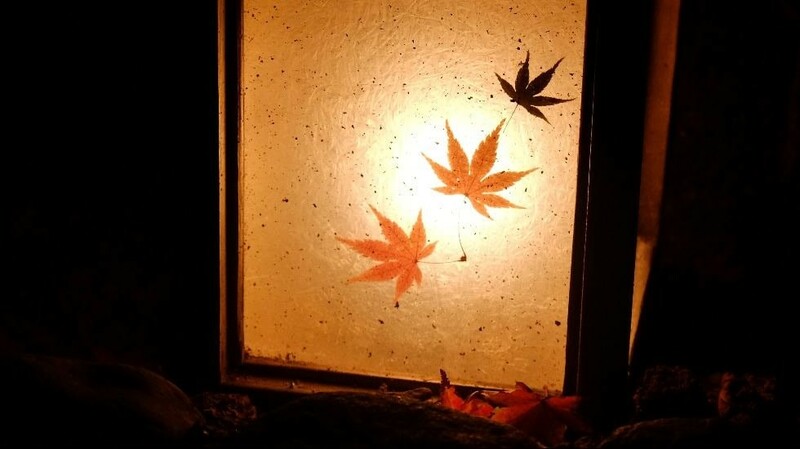 Note how the lanterns actually have real maple leaves decorating them. So pretty! So that was Ohara at night! So, that was Ohara for 2018! The leaves were pretty, but unfortunately, because of the two typhoons that hit Kyoto in autumn, the leaves were not quite as pretty as normal. That’s why the night atmosphere of Hosen-in felt really special though! Highly recommended for those who want to experience something unique, but be sure to bring something to entertain yourself with, as you’re probably going to have to do some waiting in Ohara before the event starts.